The town of Appalachia, Virginia has adopted the slogan “We Are Appalachia”. Being in the heart of the Appalachian Mountains there are many ways one hears “Appalachia” used, but as the Town’s Manager, Fred Luntsford, told us they can use it in any way they want but “WE ARE APPALACHIA”! This little town is pulling itself up like a Phoenix from the coal ashes that made it king for many years. The crowning jewel for the town was the dedication of the Powell River Trail in October 2017. 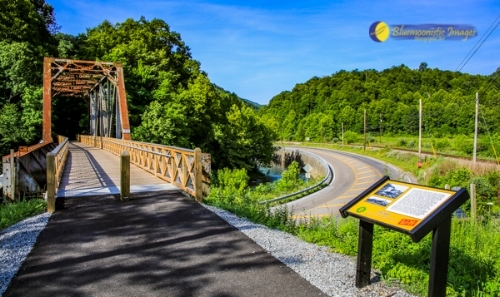 This 1.2 mile trail was established on the Louisville & Nashville Railroad rail bed that was built in the 1890s. There are many places across the country that are adapting rails to trails but this path is one of the most beautiful that the Bluemoonistic Team has seen. A walk along this trail offers two bridges and two tunnels and follows along the Powell River for added scenic beauty. The trail is flat, shady and filled with many photogenic offerings. It is a true joy on a hot, summer day and we saw many folks enjoying it as much as we were! Oh, and another cool thing about this path is there are caves along the way! There is even the Bee Rock Tunnel Troll legend that may send you exploring in the evening hours to see if you hear or get a glimpse of this Troll. Don’t know about you but the Bluemoonistic Team sure would like to be one of first to get a photo of this little guy! A troll statue is in the works that will explain the whole legend so we recommend that you go check it out! The Powell River Trail keeps even more of its historical value through the many artifacts that are along the way. Some of the debris from a famous 1972 derailment such as rails, tie plates and wheels are items you can also see as you walk along this path. These remnants of history remain for you to see giving those who walk along the trail a sense of walking back in time. As is always the case, however, this did not happen overnight and took many different organizations in the community working together. It took more than 11 years total and 1.5 years from the time shovels actually hit the ground. The dedication to keep a project like this going has to be applauded. Fred Luntsford has been Appalachia’s Town Manager for 12 years and has been a driving force the entire time. He took time with us to offer the history that went into creating this asset for the town. 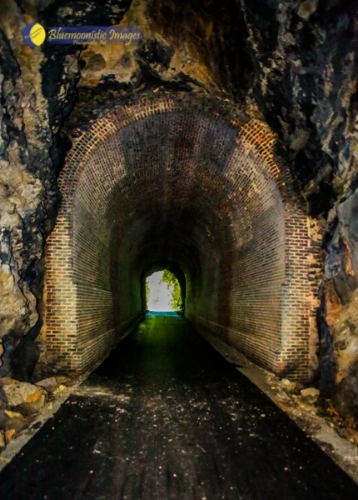 This is not the end of trail, however, as it is being extended into Big Stone Gap which will connect with its greenway system and to Norton in the other direction to create even more connectivity between the communities. There is also a beautiful parking lot at the beginning of this trailhead that makes it easy for community use. Sitting directly behind this parking lot is the fully restored Norfolk & Western Caboose 562 807 giving the area a definite park feel which also reaffirms Appalachia’s salute to their railroad heritage. This beauty was constructed in 1948 by the Wabash Railroad in Decatur, Illinois and was donated to the Town of Appalachia in 1988 by Norfolk & Western after being stationed in Norton, VA. The trail head for the Powell River Trail is the perfect location for it! We think Teresa said it beautifully! Appalachia definitely cares about its past and its future and that indeed gives the Bluemoonistic Team hope also. We believe in the power of art! Right next to where the series of murals are being painted is one of a most interesting architectural buildings we have seen. We learned that the Peak Building is featured in the Guinness Book of World Records for having three floors that open on ground level on the same street. An uphill road wraps around the building, making the first, second and third floors all accessible by the same street. How cool is that – an architectural wonder right in downtown Appalachia! Our visit was topped off with a visit to the Lonesome Pine Model RR Club in Appalachia. Another way to keep their railroad heritage alive and well. The club was started in 1993 by former interstate and Southern brakeman, Dewey Rowland. They have about 25 members today and are always accepting new members! They are presently located in the basement of the Cultural Arts building and their layouts are totally amazing! They will be moving to the Appalachia High School building after Coal/Railroad Days August 1-5, 2018. For only $2 you can get in to see for yourself their craftmanship! The Bluemoonistic Team would like to send out a special thanks to Fred Luntsford, Appalachia’s Town Manager and local artist Teresa Robinette for the opportunity to learn about another great Southwest Virginia attraction. This little town made us believe once again in the power of using railroad heritage and art to build a strong future for communities. 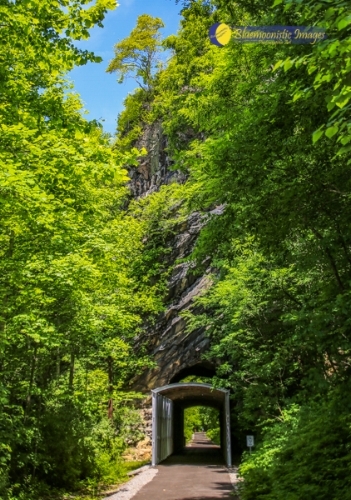 We are planning more visits in the future and will be including them in our book “Appalachian Rail Tales”! Next visit we are getting the Bluemoonistic Team T-shirts that say, “We are Appalachia”! The slogan on their town flag says it all – Born from Coal, Survives through Spirit!